So you were watching TV one night and figured that the quality of TV shows has gone down so much lately that you could even write a screenplay yourself. Or is that a script? Well, before setting off on a successful career in screenplay or script writing, first make sure you can tell the difference between the two. You can start by reading this article. A screenplay contains all the text of a play, with dialogue between characters, instructions on how to deliver each line and stage, mood, setting and lighting indications, where necessary. 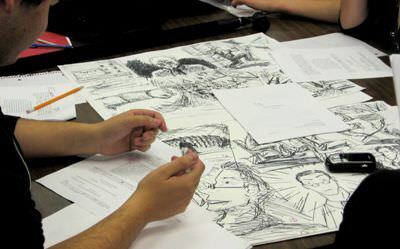 The screenplay is the broad text that helps the director form an opinion about the work. It is the way the screenwriter gets the point across and delivers the message completely. These indications are not the final ones, as the director’s vision is always imprinted on the movie. A script is the document given to actors on a set. It only contains the lines for each character, usually timed to be delivered in one minute of shooting. In this format, the document helps actors learn which line comes when, and it is supposed to be a concise and easily managed text. Actors can focus on the lines and how to deliver them, learn their order and jump from one scene to another as they are numbered for faster referencing. The main difference between a screenplay and a script consists in how much information is transmitted and to whom. The screenplay, as written initially, contains the vision of the screenwriters. It is then given to directors to decide whether or not to work on the film. Excerpts from the screenplay are given to agents to increase interest in the story and to get good actors cast in the film. This bigger text can also help the actors better understand the characters they need to portray. Apart from creating their own backgrounds and personal stories, the actors need to understand as much as possible about the character as seen by the writers. After that, as the action moves to the set or to rehearsals, the vision of the director starts coming to life. The indications of the original screenplay are changed by the indications of the director. The script contains only the lines of the movie and helps actors remember the words. It is easier to learn lines directly from the script, and it is easier to handle on the set.